Orangescrum's current customers are from IT/ITES, Education & Healthcare, Construction & Manufacturing, Individuals, Consultants,eCommerce, R&D, Telecommunication, Marketing/Sales,Hospitality, BFSI. Have used many, many different Project Management Software, and this so far has been the best! Pros: My oversea's project team has been using this software to keep tickets working, communicate back and forth, and set deadlines. I love the way you can just respond back thru the same email that notified me of the communication and not have to log into the actual software and find the ticket to respond. I wish more support companies used this program. Nothing is more frustrating than getting an email that my ticket has been responded to, but I can't see the comment or respond without first logging into the software. OrangeScrum works so well, I almost never see the ticket dashboard. Now that is perfect! Cons: As and end user, I have found nothing I don't like about the software. I only wish more support programs used it. I am a big RackSpace fan, but I hate their ticket support system...OrangeScrum would fix that if only they would give it a try. A Unique Experience When Compared To Other "More Traditional"
Pros: Our agency has been through just about every other project management platform there is. Seriously, mention one, and we have used or at the very least demoed it. The ones that we liked were crazy expensive, and the ones that were more reasonably price were only a little better than excel. OrangeScrum has a delightful blend of affordability and features. I love the dashboards and views that are available. The Kanban view makes it easy for our teams to coordinate. I can take the resource manager and better coordinate the timelines/deadlines for our clients. One unique feature that I have come to love is the "Daily Catchup" which allows me to get an automated summary of everything that was accomplished by my staff during the day. We are not a large company, but sometimes managing team and daily tasks can get a little unwieldy. Cons: The biggest issue that I am having with the platform is the billable time. OrangeScrum allows you to set certain tasks to "billable". It's great but in order to create an invoice, you need to access each "project" individually instead of a global view of all billable items. If we could get that straightened out, I think it would be a huge improvement! Pros: Reports are the new feature that has been added. We have Cloud version installed and really these feature is very useful to get accurate and average reports of tasks and no:of days spent for a particular task of a project in a fraction of seconds. Functionalities of the sub-features under 'Reports' are extremely fast and useful for a software company like our's. Resource Utilization page and weekly status are used frequently to capture daily tasks report..
Pros: Provides a step by step tracking of the entire project making it possible to plan well in advance your resources to avoid any delays. Cons: The fact that OrangeScrum is usually unstable and keeps crushing makes it very difficult to work with. Overall: Time tracking feature has enabled us balance our resources thus enabling project delivery within the stipulated timelines. 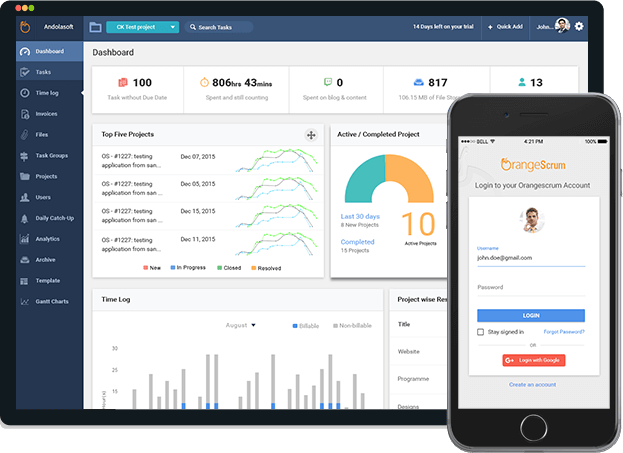 Pros: OrangeScrum simplifies your project management life: it makes easy to handle all aspects of your projects. You can easily manage tasks, create a direct communication between team members, assign resources and tasks to a particular person and keep track of your expenses. It combines project management, task management and collaboration in a unique Open Source platform giving you total control over your projects. Cons: Many things are paid, as a open source software I have expected some of the good features can be free like invoice & Client Management. Pros: Very good service, fast. Excellent support, very quick responses and they help you to solve problems (not that there are much problems, but it is good to know they help out when you need them). Cons: Not all features we needed are accessible in control panel, but their support team help out quickly to resolve issues. Easy to learn and use and has simplified my day to day running of the HR department in the company. Pros: It has time-sheet and punch in/out functionalities that make it easy to monitor employee activities on a daily basis. Cons: It experiences frequent downtime thereby making it impossible to execute important HR functions like leave approvals. Overall: It simplified the running of the HR department due to the functionalities it possesses. Pros: What I like about OrangeScrum is that it has a great user interface that allow you to easily manage projects, monitor tasks and that the open source/community edition has plenty of features. Another great pro is that it's self hosted and you're not storing your complete data set in the cloud. Cons: So far I've not been really able to determine any noticeable cons on this software other than that the software was running unstable after installation. We had to apply some manual code fixes to fix this problem, but it was minor. 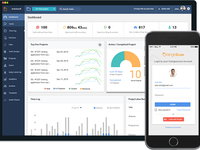 Overall: Project Management and Task Management Software that is easy to manage at an affordable rate. Pros: easy to install and its on php. anything we need we can have it changed by our developers themselves. the customer service is great. Cons: least is non that i can think of. if the prices were a bit lower for the ad-ons, it would be much popular in emerging markets and developing countries. Makes it very easy to manage and keep track of projects. Pros: Orange scrum includes an all in one screen covering all modules from project planning to visual project presentation. It is also very simply to understand and use. Cons: It is harware specific in that it only coveres mac, android, iphone and windows. There is no local coverage for linux users apart from the web-based application which not every user will prefer. Overall: Orange SCRUM is the best solution for project collaboration within a team. It is a great easy to use tool to take control of my development projects. Pros: OrangeScrum has all necessary features for project control, is user friendly, easy to use and free source. So you can use it as self-hosed free version with the basic features or as a cloud solution. In both ways you can upgrade the system with a lot of extra premium features for your daily work. The customer support team is great and experienced. Really good opens source software. It helps organizing projects. Pros: Easy to use, yet full of functionality. Different ways to view projects and tasks. Mail notifications. Project reports. Cons: Most of the functionality uses ajax. Therefore sometimes you have to refresh the page to get the updated data. Time spent on project can only be saved as fraction of base 10. Pros: Ease of use, very good customer service and an affordable price. We are using Orange Scrum for an year after a deep research for a good and affordable online project management tool and we are sure now that we chose the right one. Cons: The interface design is sometimes not as eye-catchy as in other similar but more expensive online project managers. Very robust and simple to use. Has a lot of features right out of the box. Pros: Easy to get organized and set up tasks and projects. Subgroups are helpful. Time reporting is a really nice feature. Customer service is excellent. Cons: Links don't always take you to the right places, and the executive level reporting needs improvement. Overall: Gives a small to medium sized company an easy way to get organized and increase efficiency. Orange scrum is a superb system that has enabled our team to work in collaboration on projects. Pros: It enables project progress tracking on each of the project modules. It assists in time management to ensure projects are completed in timely fashion. It simplifies human resource tasks such as time sheets, attendance and leaves. Cons: The software has a lot of unresolved bugs, Which makes it very difficult to setup correctly and this is also reflected during system usage where the system may crush and causes loss of useful data. Very simple project management software, amazing for start up companies. Pros: I really like how it is extremely easy to use. Especially for its price point, you can get a lot out of this software. Cons: I definitely wish there was more to it. I would be willing to spend a tad bit more to be able to customize it more. Take control of your project and tasks efficiently. Pros: I was very impressed with the ease of use of its interface and all its features to manage projects. It is a platform that can be customized to our needs. It maintains a technical support that offers assistance to any requirement. A very important fact for those who manage their projects using other platforms, is that it offers a specialized service in migrating data from their projects to OrangeScrum. Cons: The software seemed quite stable, flexible in its use, but they have many more benefits that are only applicable to your project as long as you acquire the payment license, of which there is a wide variety at affordable prices and according to the importance and complexity of this tool. Pros: *On-Prem - coming from an IT company, keeping all your data local and protected is a massive benefit to any organization. *Easy and clearly visible tasks that need to be completed. Allows our team to quickly gage task that need attention to get projects completed faster. Cons: as of right now, I have not found any major issue with the software. Easy to setup which make life a breeze when your a small shop. Nothing more which I can think of. Pros: It allows self hosting. And it's free source. I like the fact you can redesign it to whatever you want from it. I had some questions about direct sharing tickets, the support easlily guide me through. Cons: Some features could be more accessible, the global use of Orangescrum still really easy and nice to use. Pros: This software looks amazing and works beautifully. Cons: Nothing. I can't find a single issue that I could complain about. Overall: The support staff went over and beyond to help me set up my copy and install the add-ons I purchase. Worth every penny! Pros: It is very useful for the students. As students who don't have keen knowledge in the field of project management can easily learn important skills. It is very beneficial. It has useful demo also for many options. Cons: It just need to have some detailed description of options like one line definition for task group and task. Pros: OrangeScrum is a software that has all the necessary features for project control softwares. I like that the registration is very simple, the price is easy to understand and perhaps for teams of many people can reduce the usual cost of this type of software. It includes time log, generation of invoices, control of tasks, assignment of responsible, management of the status of each task within the project. It has a Gant view and another Kanban view. Cons: What I do not like is that at the design level it does not look modern and maybe it can improve in that sense; however, it works as it should. Another thing that I do not like is in the subject of the invoice, I can not change the location of the elements of the invoice to adapt it to my current invoice scheme. Similarly, the invoices are not intended for a public outside the United States, for example, for the Latin American market it is necessary to include fields within the invoice that do not exist in this application. Overall: It allows me to take control of my development projects. We are currently evaluating it and I think it can be an option against the popular Atlassian Jira. I think that to achieve a significant cost savings, it should be used in groups of 10 or more users. Simple and easy to use project management tools. Really love the quick and responsive support! Pros: Simplicity and easy to use. Has many add-ons and very modular. The people behind this product support are excellent, they provide quick responses to problems I had before. For me this product is best value for money to spend on project management tools. Cons: Its too bad the application written in PHP. There is no option to personalize themes through configuration panel. I also cannot found a documentation to write an add-on. Overall: I can handle and monitor the progress of my projects through websites and mobile devices. Cons: Wow this web application is horrible under the hood. Terrible documentation, difficult to safely install and customize, even worse security and super buggy. Plus their website and business approach is like a late night infomercial... Buy buy buy... Now now now! Nothing about this project inspires trust for professionals looking for a good project manager tool. Cons: gantt charts require paid module, security poor, inflexible install (or poor documentation). Overall: Installing other than the default (dedicated site) is tricky - I never got a sub_folder path install to work. The default security is scary - they suggest making the webroot directory world writable (not necessary - just set the group to www-data and group writable). The cool add-ons are never free. Gantt etc are another $ - depending. However, it is smooth and easy to use once installed and provides a nice free self-hosted project manager for simple projects. Recommendations to other buyers: Use a default (site specific) setup. Pros: The software allows multiple people to undertake specific tasks in one project transparently, i.e. one is able to know what the other is working on. Pros: The ease of using the software and generation of reports in real time by use of some clicks only. Cons: The software is not free for anyone.After trial period is over, you have to purchase it to continue managing your projects. Pros: It is a highly manageable project platform, very intuitive, very sequential processes, support templates for any type of project and a series of tasks and activities designs that allow you to give a timely follow-up to your projects and the collaborators of your company. Overall: with a design suitable for monitoring senior executives / everything is fabulous, it is graphic, modern, intuitive, easy to navigate, applicable to all kinds of projects, excellent! Comments: Very very easy to use. A nice onboarding. We love it since we started using it. Everything is there for Project management and collaboration. The only cons I feel that, there is no direct contact to Orangescrum via Phone. But the Email support is so good that, you don't need the Phone number. Cons: the poor reporting reports capable on this software. Also it was hard to communicate with someone on the capabilities. Pros: The customer support email team is awesome. This software is really user friendly and very simple to use. Cons: It's almost too simple at times, but it's good for beginners and very easy for a whole team to use, so sometimes simple is good. Pros: Loved the user interface. Customer support is good. All problems solved successfully. Cons: Free Subscription is only one month. So make proper use of this software. Pros: This is a simpler project management software that is easy to use with a great customer service team. The price is super low and the layout is very intuitive. Cons: There is very little personalization and very few bells and whistles, which is something I actually like and look for in a software.